Counting down to the ceremony with numerical highlights from Academy Awards history. Pop quiz: Which VIOLET GREY muse received Oscar nominations 19 years in a row? Which Hollywood dynasties include three generations of Academy Award winners? And is this the year Leo will finally win? While we may not be able to answer the last one, we’ve crunched some numbers to bring you Oscars highlights from the past 88 years. We’d like to thank the Academy. 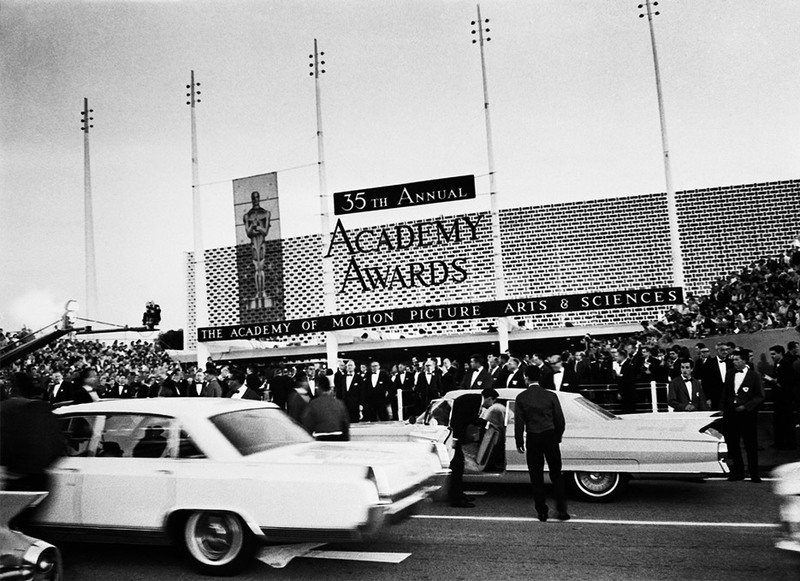 The inaugural Academy Awards, which took place in 1929, lasted just 15 minutes. (To be fair, the award recipients—including Charlie Chaplin, who received an honorary award—had been announced three months earlier.) The longest ceremony was in 2002, lasting a marathon four hours and twenty-three minutes. Liza Minnelli won the 1972 Best Actress Oscar for her role as Sally Bowles in Caberet. Her father, Vincente Minnelli, took home the 1958 Best Director Award for Gigi, while her mother, Judy Garland, was awarded an honorary Oscar in 1939 for her turns in The Wizard of Oz and Babes in Arms. Elizabeth Taylor certainly didn’t shy away from multiples—whether with husbands or Oscar nominations. The actress was nominated in 1957 for Raintree County, 1958 for Cat on a Hot Tin Roof, 1959 for Suddenly, Last Summer, and 1960 for Butterfield 8, when she finally won. She also took home the Best Actress statuette in 1966 for Who’s Afraid of Virginia Woolf? Original power couple Laurence Olivier and Vivien Leigh had three Oscars between them. Olivier won Best Actor for Hamlet in 1948, while Leigh won Best Actress for Gone with the Wind in 1939 (before the two were married), and again in 1951 for A Streetcar Named Desire. Joanne Woodward, meanwhile, won Best Actress in 1957 for The Three Faces of Eve. Not to be outdone, husband Paul Newman snagged the Best Actor Oscar in 1986 for The Color of Money. The winner in question is none other than Miss Katharine Hepburn, who managed nine Best Actress nods and a record four wins—in 1933 for Morning Glory, 1967 for Guess Who’s Coming to Dinner, 1968 for The Lion in Winter, and 1981 for On Golden Pond. The director never took home a competitive Oscar, but received an honorary award in 1993. Costume designer Edith Head was nominated 35 times, with eight wins and a 19-year run of consecutive nominations. Fashionable indeed. Actor Walter Huston, director and screenwriter John Huston, and actress Anjelica Huston all took awards home to the mantle. Composer Carmine Coppola (for his work on The Godfather: Part II), directed by his son, six-time Oscar winner Francis Ford. His daughter, Sofia Coppola, snagged her award for Best Original Screenplay for Lost in Translation. Tatum O’Neal was just 10 years old when she won the Academy Award for Best Supporting Actress for the 1973 film Paper Moon, which she accepted while wearing a tiny tuxedo. Christopher Plummer was a seasoned 82 when he took home the award for Best Supporting Actor for his role in 2011’s Beginners. The Hollywood Roosevelt Hotel (the original location); the Ambassador Hotel; the Biltmore Hotel; Grauman’s Chinese Theatre; Shrine Auditorium; Academy Award Theatre; Pantages Theatre; NBC International Theatre, New York City, and NBC Century Theatre, Los Angeles (at the same time! ); Santa Monica Civic Auditorium; Dorothy Chandler Pavilion; and Kodak/Dolby Theatre have all taken turns in the hosting spotlight. The civilian’s answer to snagging multiple nominations? Snagging invitations to the most important after-parties. The in-the-know will be stopping by the Governor’s Ball (for statuette engraving, of course), Vanity Fair’s ultra-exclusive, see-and-be-seen soirée, Fox and New Regency’s after party, Elton John’s AIDS Foundation charity, and, once all the photographers have gone home, Madonna and Guy Oseary’s after-after-party. All About Eve and Titanic remain tied for the record number of nods in any given year. Titanic truly lived up to its name, going home with 11 awards to All About Eve’s six. That would be the inimitable Meryl Streep. Out of 19 nominations, Streep won three times, for Best Supporting Actress in Kramer vs. Kramer in 1979, Best Actress in Sophie’s Choice in 1982, and Best Actress in 2011 for The Iron Lady. The world’s favorite modelizer has been nominated for Best Actor four times and Best Supporting Actor once over the past 22 years. While he failed to win for his roles in What’s Eating Gilbert Grape, The Aviator, Blood Diamond, and The Wolf of Wall Street, Oscar soothsayers predict this will be Leo’s year. Sally Field’s gushing (and regularly misquoted) acceptance speech after winning Best Actress in 1985. Keep abreast of all things Oscar and follow The Violet Files’ pick of the power women of Hollywood on social media.